The Fuzz Run Committee created a special competition challenge for the local businesses and decided to name it after our Chief of Police, Stacey Cotton, who has always shown such great support for the Fuzz Run. We call this challenge, The Cotton Cup Challenge. Every year local groups and businesses show their community spirit by competing to see who can register the most Fuzz Run participants. This competition provides a great team building opportunity for employers to engage with their employees, and promote community involvement. The Cotton Cup Challenge provides organizations with additional advertisement during the race event, as well as on the Fuzz Run website. Participants will receive a discounted rate through the Cotton Cup Challenge. As an added bonus, the winning company gets to take home the Cotton Cup trophy to display, and bragging rights! A business representative will organize a Fuzz Run Team for their organization. Some companies choose to pay for their employees’ entry fee to the race to promote team building and wellness within their structure. The team representative will gather all the pertinent information needed for the race as opposed to each individual member signing up for the race online. This representative will be responsible for the race entries and picking up the team’s packets. The Fuzz Run committee will organize the team packets and have them ready for pick up at the EXPO Friday. Don’t miss this great opportunity to have some healthy competition within your organization. Join today! 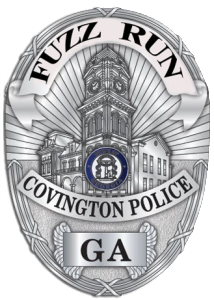 For more details, email fuzzrun@covingtonpolice.com. Friendly and fun competition for all levels of athletes! Challenge your buddies to see who can cross the finish line first – winners in each group will receive an award and bragging rights among your friends. All runners will still be eligible to win age group categories. Walkers and runners alike can compete in groups of ten or more during the Fuzz Run 5K. Show your spirit with a fun team name! Group Competition entrants must register online by August 23, 2019.